Ok, it is official, everything I said about our sweet dog is taken back! Especially when the taking back in question involves shoes! The first time I found Taavi gnawing on this shoe, I popped him with it and fussed at him pretty good. I saw him yesterday running around the house with it in his mouth and then today, he got in my closet, AGAIN, and chewed it up. Thems be fighting grounds. And yes, I did use incorrect grammar and say “thems”. No, these shoes were not very expensive, but they were my VERY favorite pair of shoes! My favorite flat, silver, pointy toe, faux snake skin shoe! Since this is a post about shoes, here are a couple pics of Vivian two nights ago trying on my new boots. After Vivian got her bath, Steven found her in our room zipping up my boots. She was happy to model them for him! “Japan is an important partner and friend of the U.S., but on this issue, our points of view differ,” the U.S. Embassy in Tokyo said Tuesday. “Our two nations approach divorce and child-rearing differently. 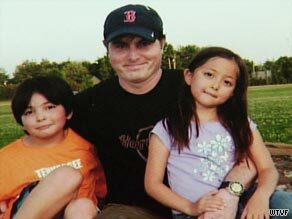 Parental child abduction is not considered a crime in Japan.” For the full article, click here. If parental abduction is not considered a crime, then why is he in jail? This doesn’t make sense. Ok, I know that it is probably not polite to laugh, but when I saw this picture, I couldn’t help myself…. For the full slide show and story, click here. Last week, Sunday, I had the privilege of joining likeminded preservationists at the Louisiana Trust’s unveiling of the properties that made their annual 10 Most Endangered List. The Historical Association of Central Louisiana nominated the CLSH Dairy Barn in Pineville and the Armour Building on Lower Third. The City of Alexandria Historic Preservation Commission, in short, Melinda Anderson, was responsible for the successful nomination of three other Cenla properties. At first, I was excited that five of our properties made the list. However, that excitement was short lived when I realized that it really is not an honor that we (Alexandria) have so many properties listed. It is actually sad that we had so many buildings to nominate. One preservationist at the event said “Alexandria, you need to get busy!”. So true. Nottaway Plantation was beautiful. I enjoyed touring the grounds and the restaurant. Nottaway just underwent a “multi-million dollar renovation” by sprucing up the main house, building two pergolas, a pool and an assortment of out buildings which host parties, weddings and other events such as the one I attended. Here are a few pictures I was able to take. I found it hard to hold my program while juggling my evening bag and large SLR camera. So, basically, they are what they are. I had a great dinner and wonderful conversation with fellow HACL members Judge Rae Swent and Dr. Phillip Tapley and other preservationists from across the state. Alexandria: We need to get busy! Our friends' son, Carson, was in it. He is the one in red on the table. We took Vivian to see the musical Childrens Letters To God. It was very cute. After we arrived home, Vivian spent an hour dancing and singing! I knew she would like this! She watches a lot of the old musicals on Netflix. Yesterday, before we went to work on our rent house, she had to dress up and have a fashion show. She dug out her play microphone from Cracker Barrel and made me introduce her. She also had a solution for world peace and some other things I couldn’t quite understand. Even though I was still in my nightgown, she insisted I participate in the fashion show too. So, I strutted my stuff, complete with magic wand and all. NO THERE ARE NO PICTURES OF THAT! Thank God! I also posted the after bathroom pic here. I put it with the before pics so you would have something to compare it too. It is far from done, but, progress nevertheless. Anyway, we had a good weekend. We hope you did too. Back to work tomorrow. Taavi is a mess and a half. You think he is trying to tell me something? Who wouldn't like coming home to this face? I don't think I could have extended my neck any farther! I have to put him in his kennel when Vivian takes a bath, otherwise, he jumps right in! He loves baths! While I am in a sharing mood, I will post pictures of our hall floor. I do not have the time or money right now to sand down all of the floors in our house and refinish them, so I bought some Restor-a-finish from Lowes and followed it up with a nice beeswax. You rub the restor-a-finish into an unpolyurethaned (not sure if that is a word) floor and it covers scratches and scrapes until you can completely have your floors redone. It looks nice! I only did half of the hall and you can tell where I stopped!